This morning, we left Bonifacio in the rain. We had a walk to the Piazza, amidst all the building and paving works. 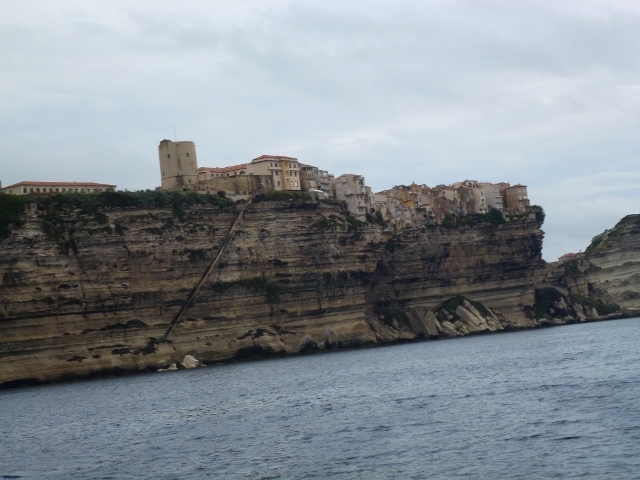 Even in the drizzle, grey skies and cold morning, Bonifacio was picturesque. 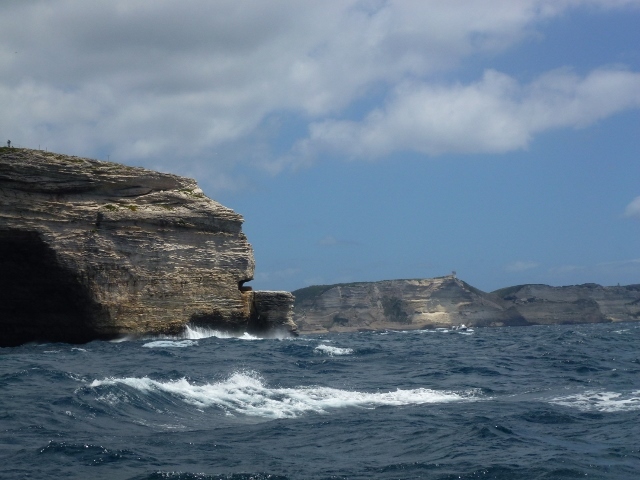 As you sail past, you can see houses on limestone cliffs that seem fixed and solid but from the sea you see large rocks of limestone which have been undermined, the huge blocks resting at the bottom of the cliff. 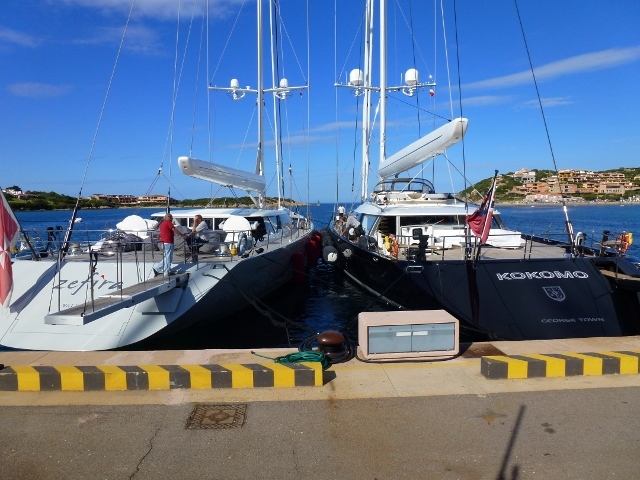 The trip to Sardinia is cold, short and easy – as long as you have an autopilot that can dodge all the reefs, rocks and islands in the Straights of Bonifacio. Even with a Coursemaster, you have to be diligent, because there is so much traffic. In the straights, you will see large cruise ships, ferries, sailing boats, cargo ships and fishing boats and all the RIBs*, making it quite an exercise in concentration. James likes the autopilot, he feels like the captain overseeing his ship and directing his helmsman. Porto Cervo is overcast as we arrive and but then the sun comes out and we revel in the warmth and sunshine. James sailed here in 1980 and can see the changes. June 1 must be the start of the season, because there are two regattas coming up and several super yachts have come in since we arrived. Kokomo is here but flying a Cayman Island flag. There is not a varnished mast to be seen. These masts are like church spires rising 200 feet in the air and maybe 8 feet across at the top. 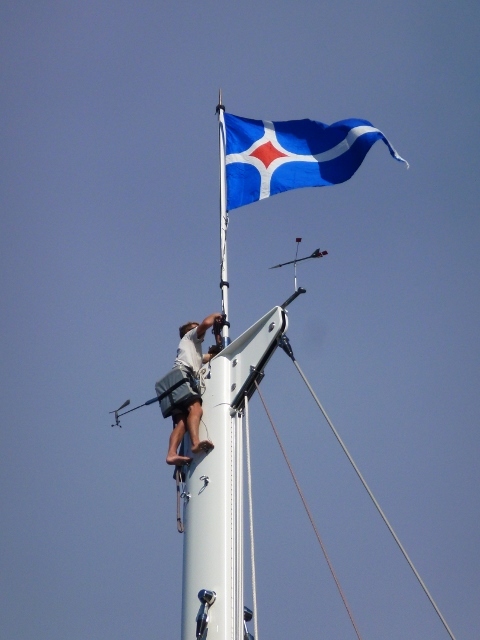 We have a photo to share with you – raising the club burgee on a Super Yacht. We wish we could share the scents of the fresh bread baking wafting from the Boulangerie in the morning and the church bells ringing here in Porto Cervo and the jazz streaming from Swiss Jazz. At the moment, we only have bandwidth for words and photos, so we hope you enjoy them. Sunday was a sunny, bright day. 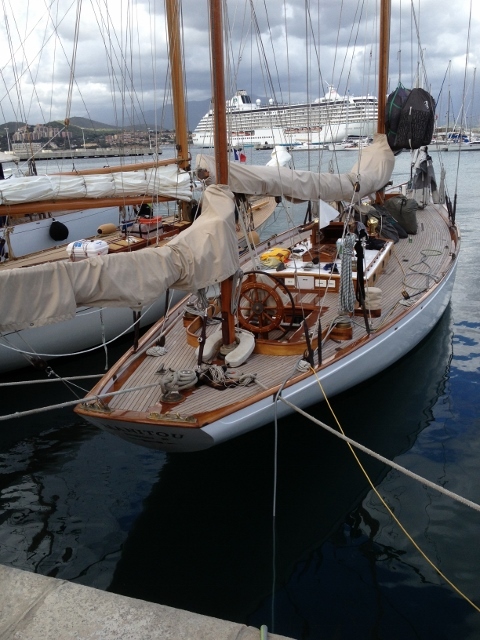 When we left Ajaccio, there was a reasonable wind so we were off to Bonifacio. After the wild wind we have been having, the wind was too light to carry a main. The waves were big rollers, 4 metres high, reminiscent of waves off the coast of NSW. The weather was sunny and very cool. 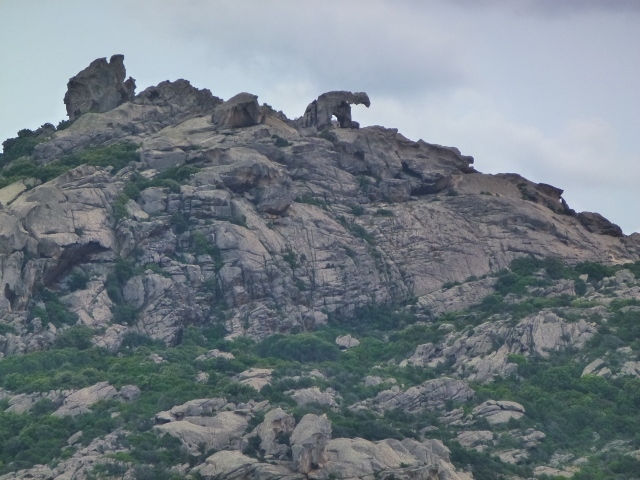 We rounded the cape south of Ajaccio and the rollers diminished somewhat, the wind stayed on our stern quarter. 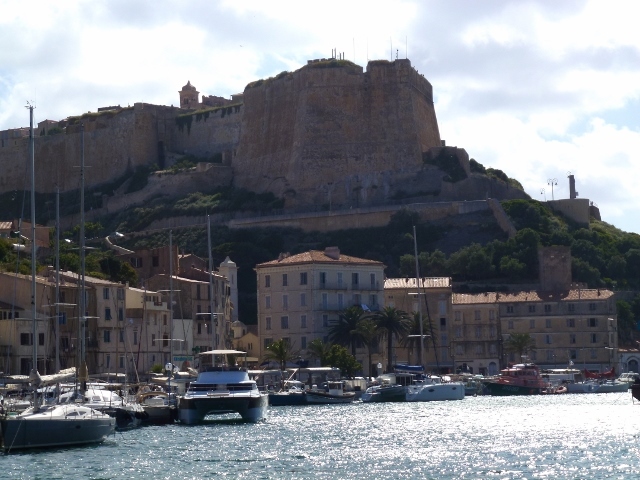 An hour out of Bonifacio, the wind picked up to 20 knots, the wind chill went down to about 10 C. Thirty minutes later, we were delighted to see the citadel on top of the hill in the distance. When you are even ten minutes off the coast, you don’t see the entrance to the harbour. Then finally you see the light house and you enter through a very narrow entrance. The harbour is very narrow, about 200 metres wide, even closer to the city. The harbour is really like a calanque or fjord, with 2 smaller calanques off to the side. We found ourselves a berth and a nice man from the nearby restaurant “Kissing Pigs” took our lines and helped us to moor, so it was only fitting that we had dinner there, and it was a very nice meal. We spoke to another sailor this morning and she said in the gale force winds of last week, there was a storm surge into the harbour, not at all pleasant on the boat. So we picked the right place to be, because Ajaccio was relatively comfortable. 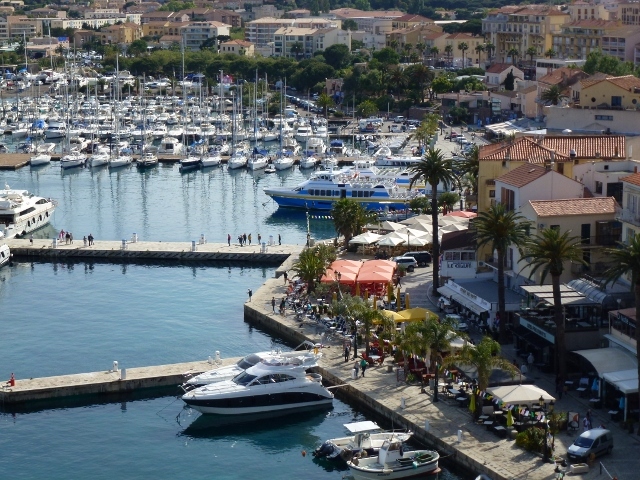 The town of Bonifacio seems to be split into the newer parts of the city at the marina’s edge and the historic centre of Bonifacio haute ville. The citadel is circa 9th Century and recently has been a administrative post for the French Foreign legion. From the outlooks in the citadel, you can look directly across to Sardinia. 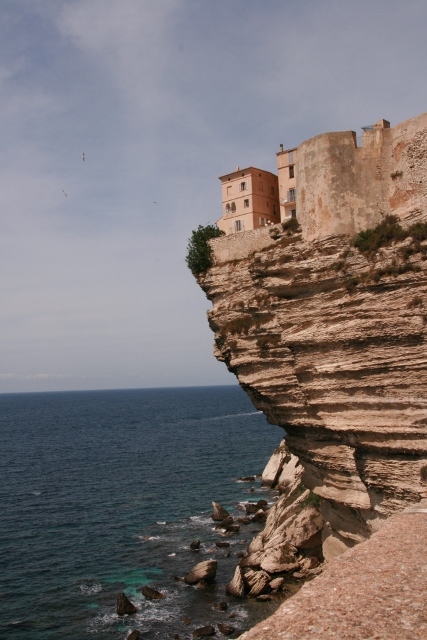 The The striking view highlights the fact that the Straits of Bonifacio are only six miles wide. Absolute Waterfrontage, stunning views – going cheap? Day 5 in Ajaccio, and it is not really part of the plan. However, in the Med it is best to let the weather guide you and not tempt fate by going out in rough conditions, especially two up. 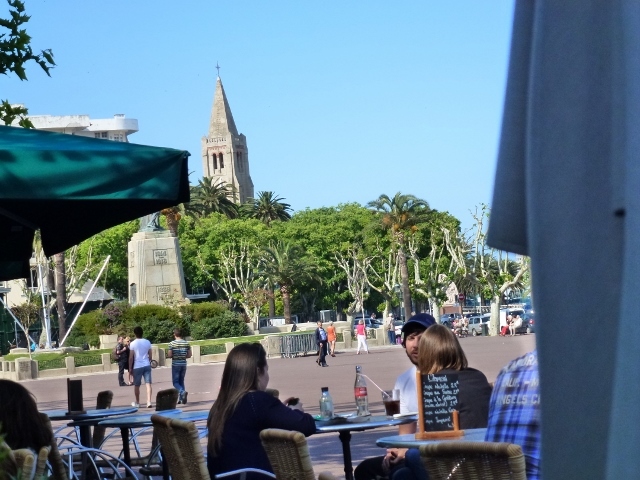 Ajaccio has some interesting diversions, trains to Corte and a good shopping centre, including E. Leclerc and Monoprix. The boat is now fully stored with supplies, water and we even found a bottle of Mercier champagne to have with the Swannos. Today, to escape the cold & rain, we went to the Palais Fesch Museum to view religious art, Napoleon’s family in sculpture and paintings, European and Corsican paintings. 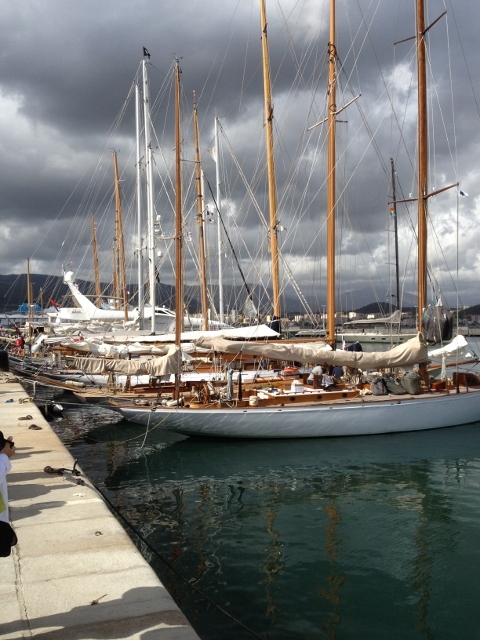 When we came out the sun was peeking out, so we walked down to the marina to see the classic wooden yachts. 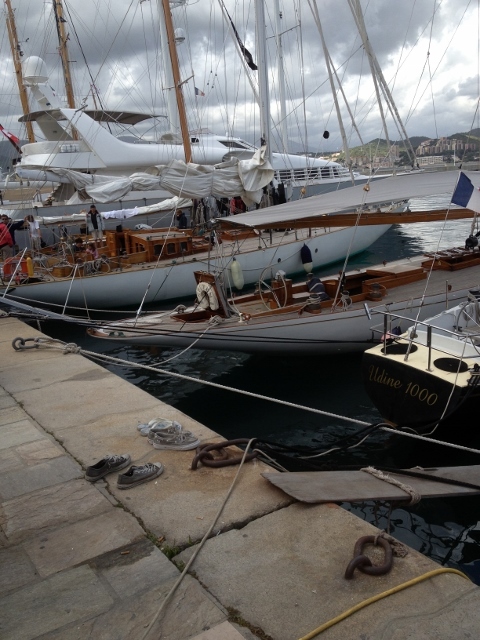 These yachts were from Italy, Ireland, UK, France and the US. We don’t think they went out to race today due to the heavy winds or at least not for long. We did see one yacht which had sprung a few planks in the racing. James noted the “plethora of varnished masts”, today we saw them working on the boats and perhaps putting some finishing touches on a varnished spinnaker pole. Not every second is taken up in sailing, this week we have jumped on trains twice to get to some lovely and more remote places. 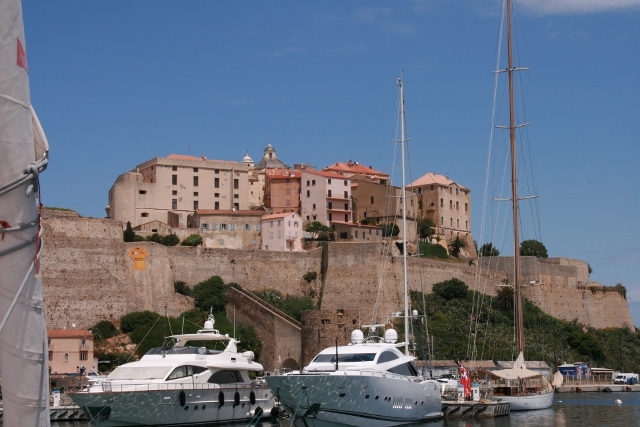 Calvi is a great port, natural beauty, lovely restaurants and great history. 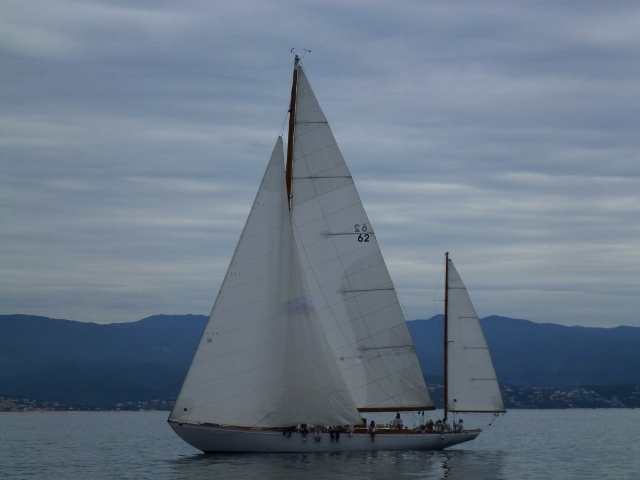 On our second day there, there was a 35 knot southerly and we decided we would jump in the two car train to L’Ile Rousse. We arrived to a market for veggies as well as another for small treasures. The beaches are all white sand and the sky was azure blue, later in the day the sea was covered in white caps. Before the last train for the day came in, we decided to walk to the old light house on the point and we were caught in an isolated downpour. We ran back to a wonderful cafe with giant oversized armchairs and watched the single rain cloud sail right past us. On the way home on the train, we would look out and see dozens of wind surfers having a great time. They were like colourful bullets dashing over the surface of the waves. It might not have been our weather, but it was certainly theirs. 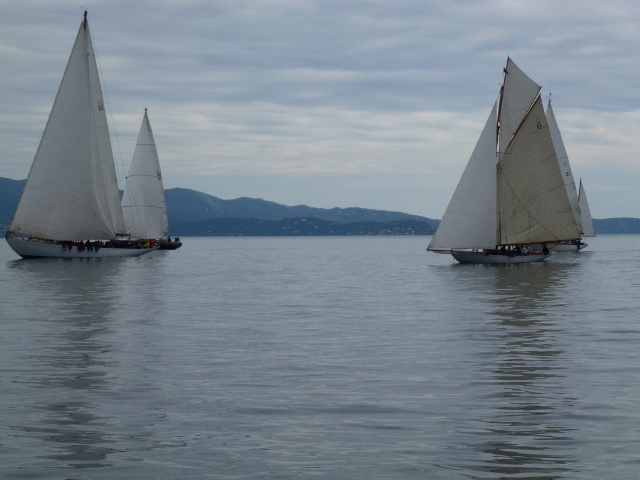 Losing a day, we decided to skip the trip to Piana and motor sail directly to Ajaccio. We sail through the rocky portal of Iles Sanguinaries, past the old Citadel. 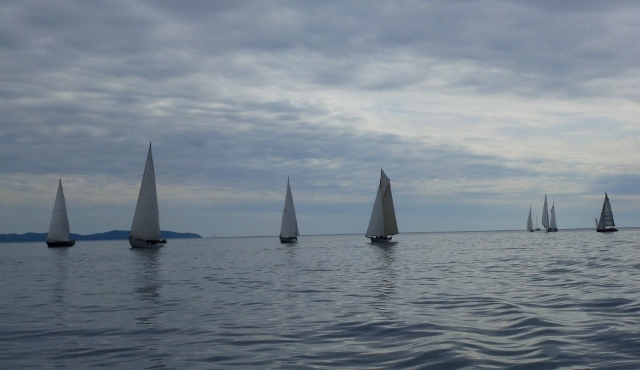 At dusk we happen upon a regatta of old wooden boats, a beautiful sight in the evening light. As James said ” a plethora of varnished masts”. 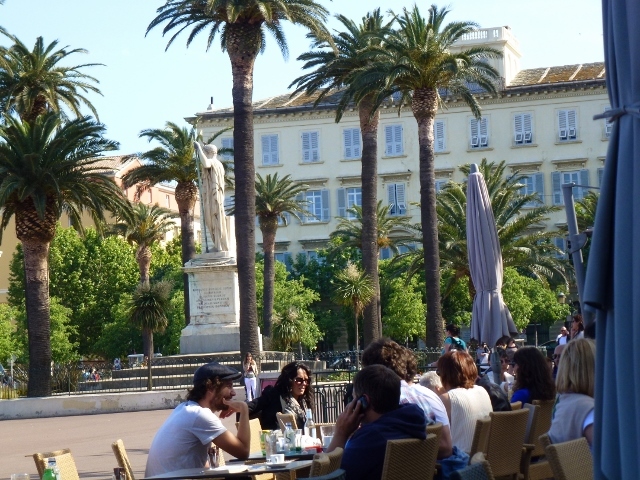 Napoleon’s home, Ajaccio is a very modern city and the marina is one of the best we have been in. A clean and modern laundry just past the Captainerie’s office and hot showers on demand. 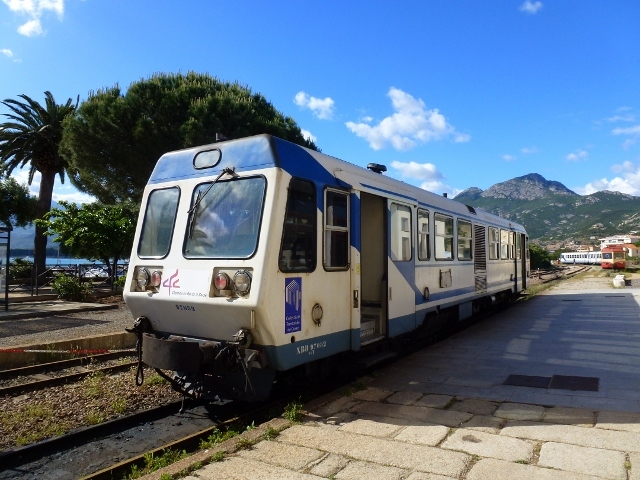 Yesterday, we left the boat in Ajaccio early and took a very modern train to Corte up in the centre of the island. Initially, you go through very suburban landscapes, then boat dry docks and a more industrial landscape. Quickly you turn and go up through a valley of steep inclines and deep ravines. Looking across the valley, you see a giant waterfall thundering down the mountain just below peaks still covered in snow. 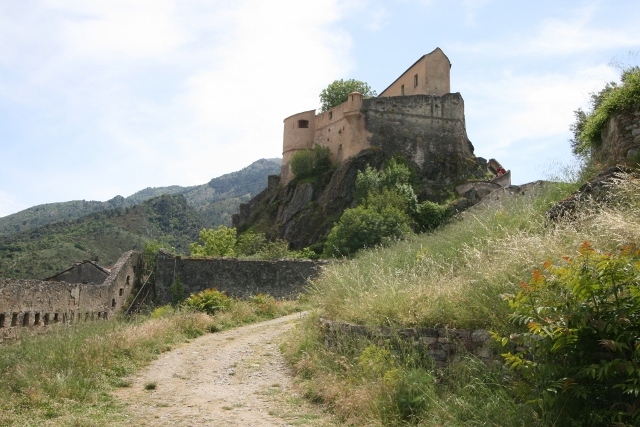 Rivers and creeks run rapids all through the centre and up to the feudal town of Corte. There are many small ferns covering the hillsides and then further up, you find magnificent pine forests. For a moment, you see a small and ancient village and then you are in the forest again. Many of the our fellow train travellers would have been hiking and camping, before jumping on the train to Corte. 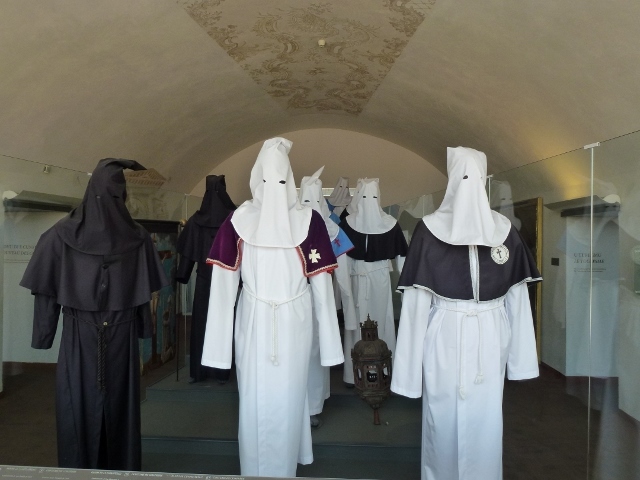 We climbed the stairs to the citadel and visited the museum, Musee de la Corse, where we were able to listen to polyphonic music and view the robes of various religious brotherhoods. Corte has reinvented itself by inviting foreign students to join its university. So many young people means great pizza and several wonderful patisserie. The stairs mean you don’t have to worry about dieting. 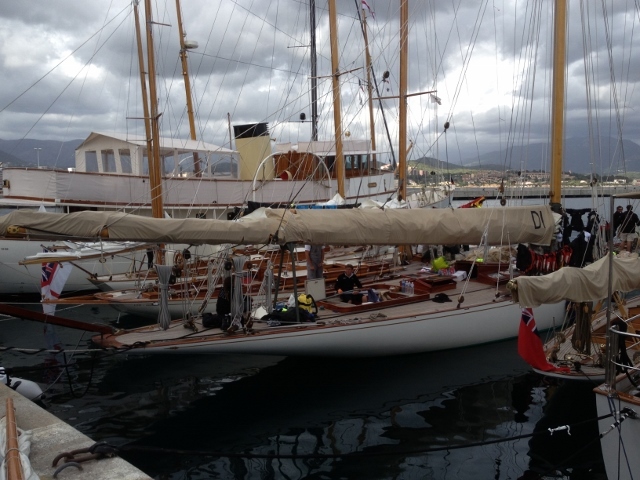 So now we are in Ajaccio, once again waiting for a break in the wind. We may leave tomorrow or the next day just as soon as the wind is right. You might notice a ‘follow me’ at the bottom of the page. You can sign up and get an email when we publish each blog. Abientot! 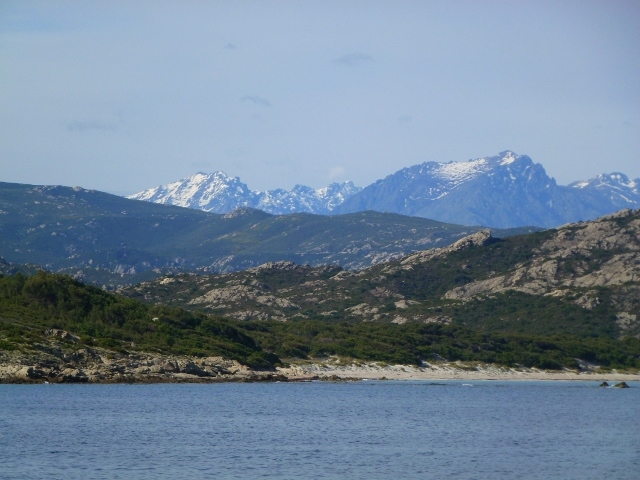 May in the Midi means changeable weather, in Corsica the weather is cold and wet and then voila, within a few minutes sunny and hot. There is snow on the mountains and if the breeze is coming from that direction, it is very chilly. The rain doesn’t cause too many problems, except out comes wet weather gear and ten minutes later it’s time to take it off again. Bien sur! 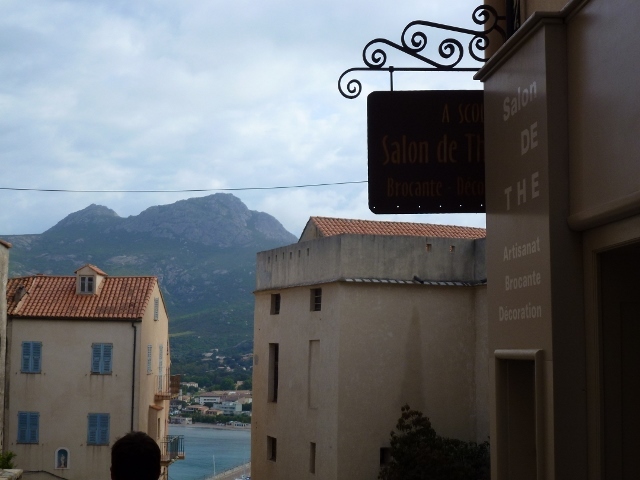 Our last two stops have been at Sant Florent, which is a small and quite lovely feudal village near the Patriamonio vineyards and a bit further South, Calvi. Getting to the vineyards proved difficult. 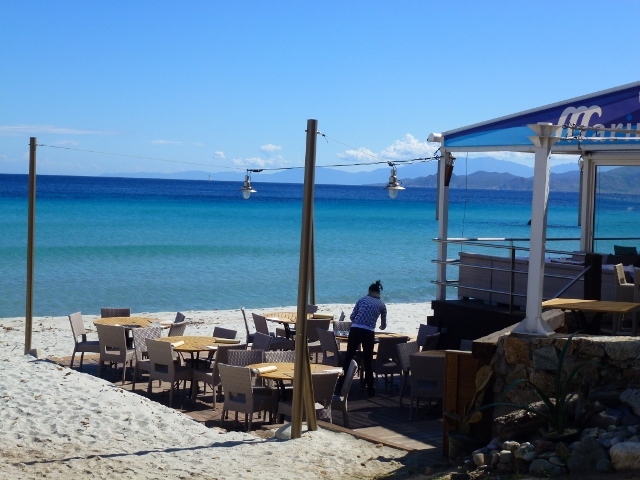 We couldn’t get to a vineyard, not a taxi, bus or car hire to be found in Sant Florent. 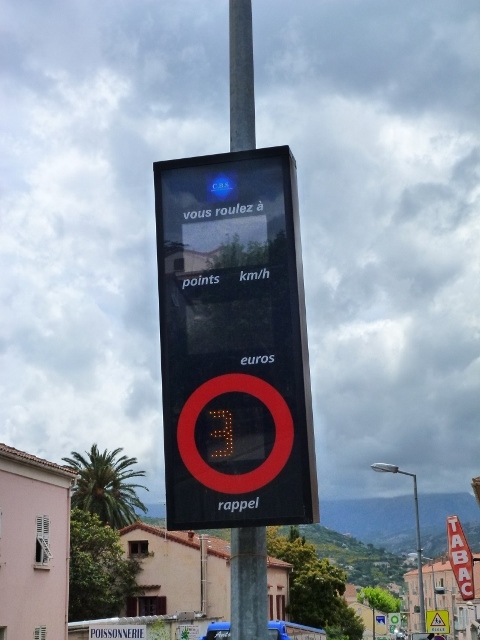 Maybe it was because they have signs to tell you how fast you are going, how many points you will lose and how many Euros it will cost you. Even though we couldn’t make it to the vineyard, there was a nice Vintner’s tasting shop which carried the very nice Corsican wine – Clos Teddi rose and we will be stocking up before leaving. (Are you coming, Rene? I will double the order). 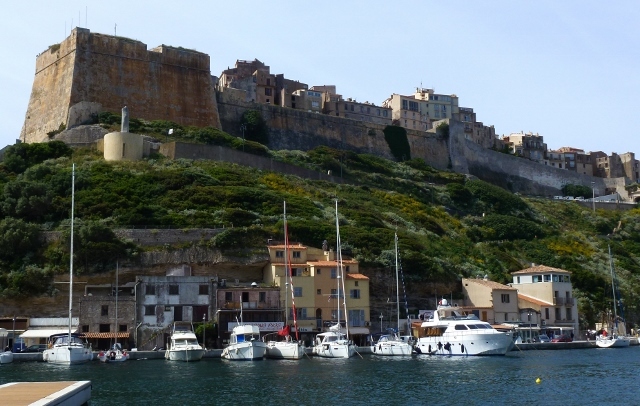 This morning we sailed into Calvi- we sailed underneath the imposing Citadel which dominates the town and the marina. According to Rod Heikell, the citadel dates from the 13th century, around 1758, Horatio Nelson took it by land, but lost his eye in the battle. It is quite a hike up to top, but on the way there is a lovely Salon de The, so we were able to have a coffee to fuel the trip up. 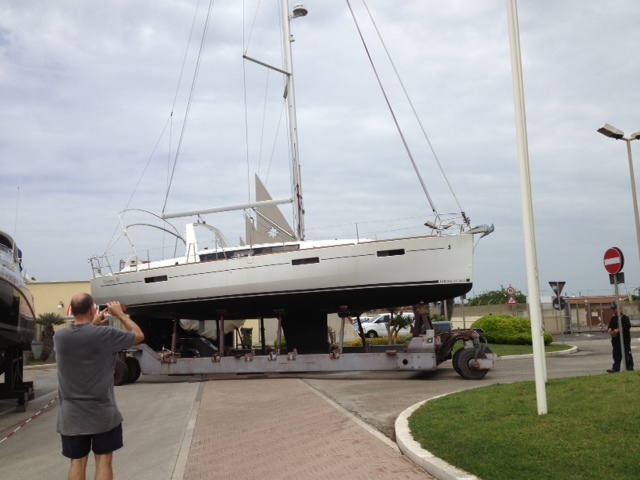 Before we went on our little walk, we had a visit by five friends from French Customs at the marina. We invited them on board, but they declined and just asked for Merciers’ papers and our documents. They were very impressed with the giant kangaroo and emu crest embossed in gold on Mercier’s Australian registration papers. They were happy with Monsieur the Engineer and then asked if we had a house in France. Maybe it is the RSYS that was familiar. 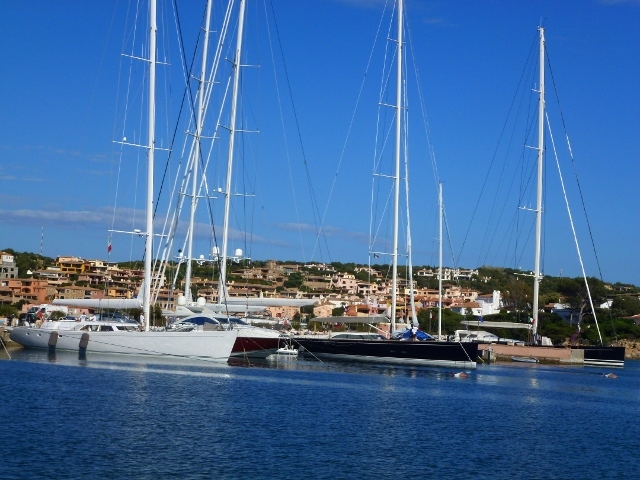 This was much less fraught for us compared last year – we have the papers and it is much easier to speak to the agents on the marina, than to have them board the yacht. On nearby yachts, people came up the companionway to see if we were illegal boat people. They were very interested to see their tax dollars at work. 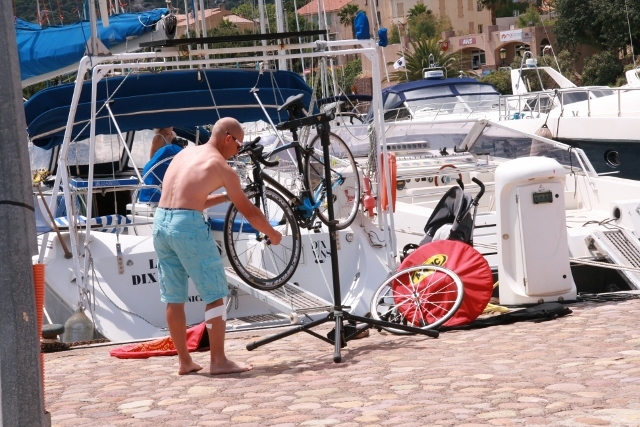 Finally, there is the French National Triathlon Championship tomorrow and one of the boats nearby brought out his bike and his very flash contraption to put it together and a bike pump which seem to come out of a violin case. We think he brought the yacht as his own accommodation. There is a book, by Dorothy Carrington, Granite Island, a Portrait of Corsica, which would be great to read on this stormy evening. I shouldn’t start from now though but from yesterday afternoon. We arrived in Bastia yesterday afternoon to an overcast, grey city, with cream, yellow or terracotta buildings, with shutters of different colours. As always, we arrive, climb stairs and run errands – buying a sim for the phone and some stamps from the Post Office, strawberries and fresh milk. Then about 5pm, the afternoon turned beautifully sunny, highlighting the peeling paint and needed repairs on the old lovely buildings. Errands done, we have a drink on the Square, in warm late afternoon sunshine under Napoleon’s gaze. The ferry’s were in the water just in front of St Nicholas Square, we sat under umbrellas in front of the vast open piazza, filled with playing children and walkers making their way to the ferries or the shops behind us. We stroll along a waterside path back to the Vieux Port, the path is built right beside the seawall and over a tunnel which lets the cars go from one side of the city to the other, the walkers on top. Restaurants line the path grabbing the sea view for their customers and on the inside of the road, men are out playing pentanque. 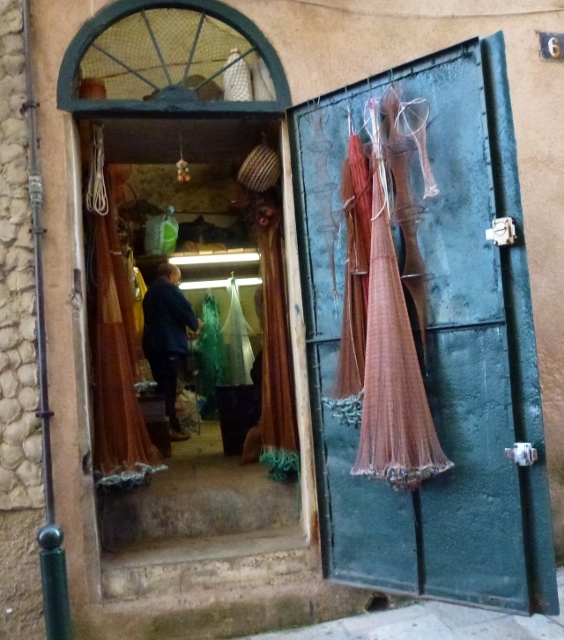 We cut through a narrow alley and we see what looks like a slip or a petticoat hanging on a door. As we pass we look in and see a man patiently creating knots to make fishing nets. He was talking to another man in the small but orderly space, hands constantly moving, making these fine fishing nets. 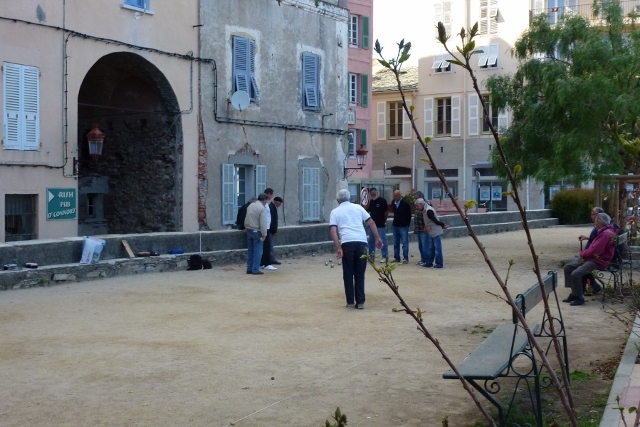 James notes how Bastia is reminiscent of Genoa, ancient and seedy. 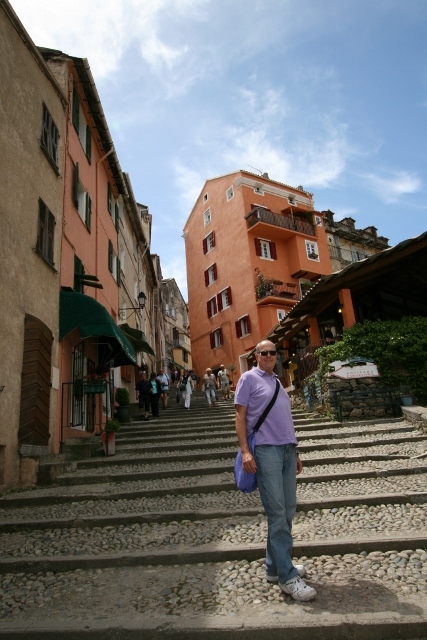 Interesting, as the Genovese built Bastia in the 14th Century. The food seems more French and we know it’s not Italy, because cars stop to let pedestrians through the zebra crossings. 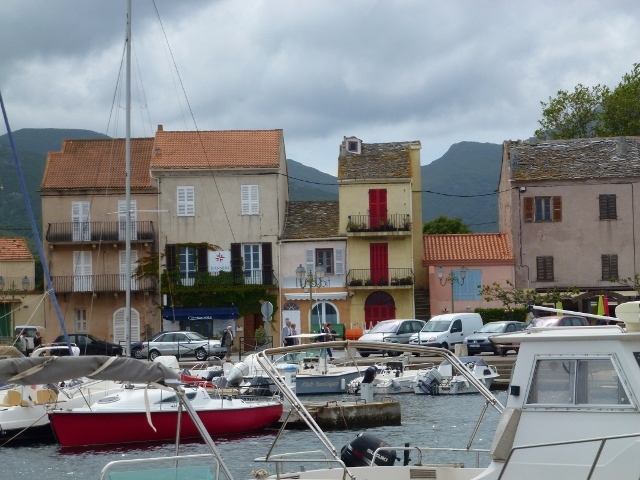 The Vieux Port is small and there are noisy building works which start early, so we decide to head north to Macinaggio, a small fishing village, where nothing has changed for many years, except the addition of a small but comfortable marina. We left Bastia in 15 knots south-easterly running north under headsail; so the sail was cold and wet but it wasn’t frightening. James saved ‘frightening’ for the finish, which was a steady 25 knots with gusts while we trying to moor stern to. Some lovely German ‘seafarers’, advised us to come in alongside the dock and the three of them caught our ropes and the bow thruster pulled us in. I reckon James is a seafarer too, we have ropes for Africa holding us in place on the dock. Another boat came in behind us and they were pulled in alongside as well. Tonight is wet, cold and the storm is set to intensify about 4 am. 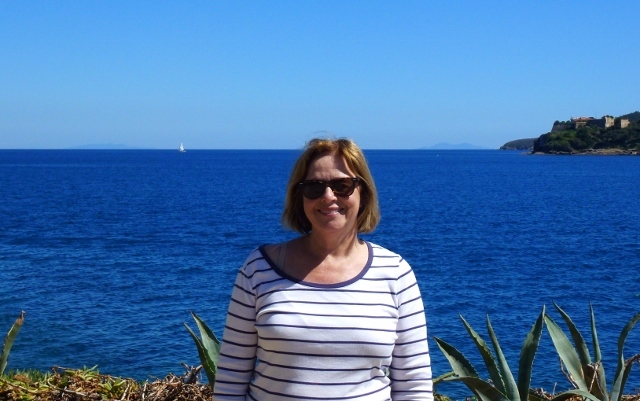 Hopefully by tomorrow the storm will pass and we can continue on to Saint Florent, where with any luck, I will be able to find a copy of Dorothy Carrington’s book. 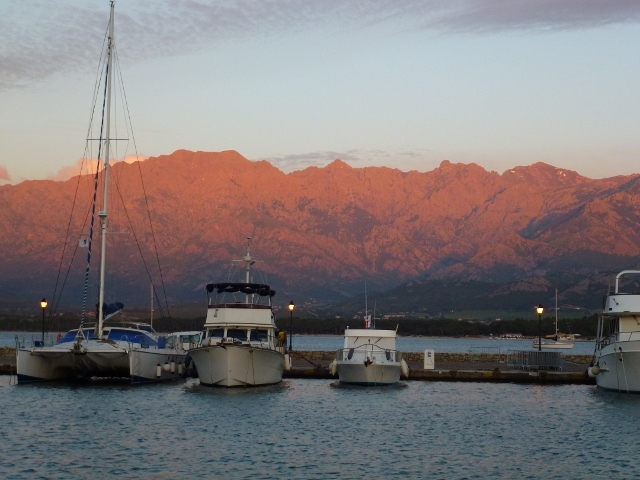 We are moving Northwest, making our way to Corsica. 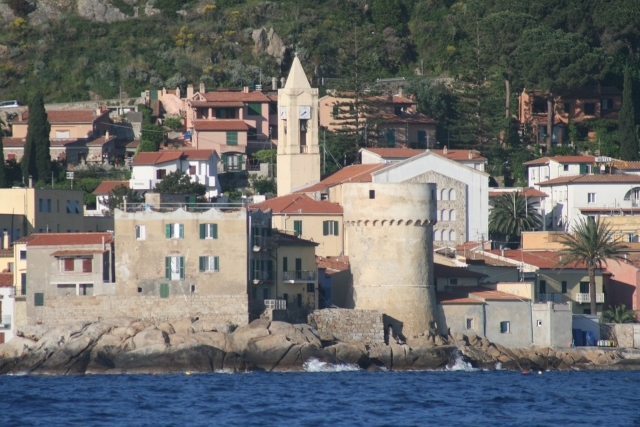 We arrived at Giglio last night and we had a night that separated the pro from the rookie. James made a wonderful dinner of veal parmagiana served with a cheeky pinot gris so we had dinner on Mercier and talked about where today would take us. It was quite chilly as the sun went down, but cozy on Mercier. Imagine – Swiss Jazz was streaming live over the weefee*, aromas and warmth coming out of the galley. We become very relaxed. Sailing and being on deck for several hours is quite enervating and off we went to bed. By 11:30pm, a south easterly swell came in and every time, I was about to nod off, the bow of the boat would rear up and slide crossways down the wave. I look across – James is sound asleep and oblivious to the fact that he is sleeping on a Coney Island roller coaster. I am exhausted so finally get up and go to the stern, which is less like a roller coaster, more being on a camel loping through desert dunes, except surely it was too cold. By 5am, I decide it would be better to move than freeze to death in my bunk, (all the blankets and covers are neatly stowed away carefully in vacuum bags). James wakes up and says “What time did you get up? I had a marvelous sleep.” Then he reminds me that there is no electricity, therefore no nespresso, aarghh – this travel thing does have drawbacks. We get underway after our second cup of tea and sail to Porto Azzuro. We sail past the Costa Concordia, which seems to be in salvage mode. They have removed panels that were ripped by the rock and we could see several welders putting on new panels so that hopefully they will be able to float her off and take her to a port to be recommissioned. We think the several stories of blue containers on the side of the ship are housing for the shifts of workers. The day starts blue and sunny and just gets more dazzling as we tight reach towards Porto Azzuro, doing 7.5 – 8 knots, most of the way. 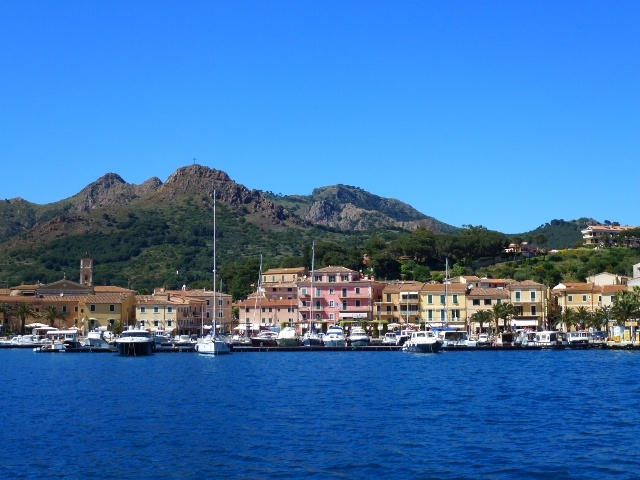 Port Azzuro is on Elba, a Tuscan island. The harbour is a jewel to anchor in and of course, you remember from the last year – the artesian gelato makers on the island make the creamiest gelato. We are hoping for calm seas tonight, no swell or I might just jump in the zodiac and find a B&B. Wish me luck. 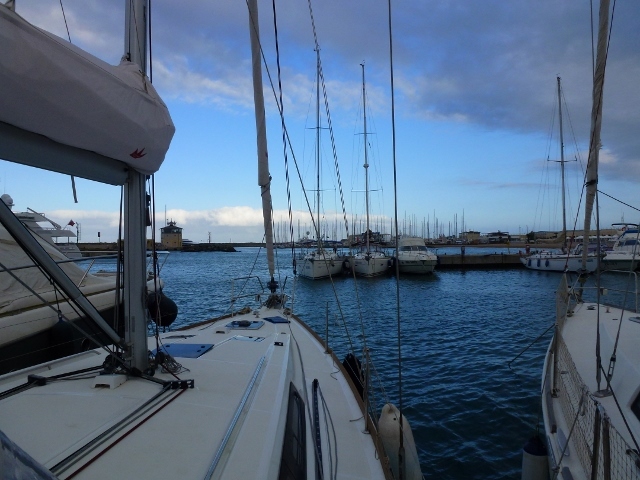 Finally, we get as much done to put Mercier in good order and we head out Saturday morning to Riva di Traiano, a marina in Civitavecchia. 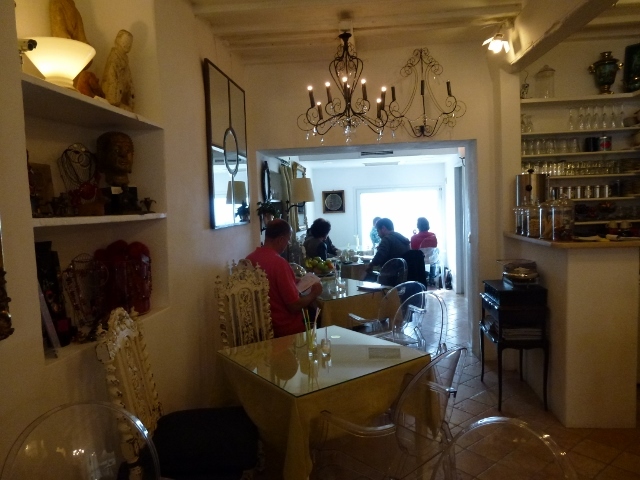 Riva is graced with several good restaurants and shops. This will only be an overnight stop as we really want to arrive in Corsica next week. We have spent a night here last July, so we know the drill and someone comes to meet us at the dock to help us get tied on. It is quite a pleasant marina and the board walk is full of restaurants and ship chandleries, as well as the occasional boat dealer. We decide to have dinner on the marina and go to Il Tritone, We look at the wine list and there isn’t one wine we are familiar with. How do we choose? Well I am reading The Leopard, which is set in Sicily and one of the Villa’s in the book is called Donna Fugata. Here on the wine list there is a wine from the vineyard of Donna Fugata in Sicily – let’s try that one. 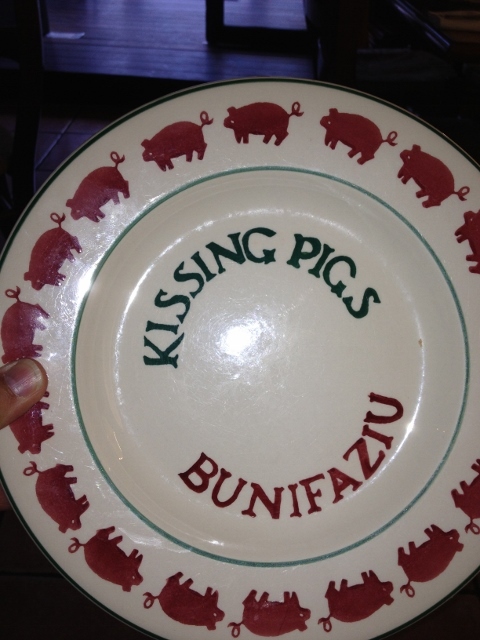 It is meant to be a white wine with hints of peach and plum, light – just the thing to have with our fish. Sadly for us, it was really more of a taste of heavy prune than light peach, I had to promise James not to use the fiction selection method again. Next time we will ask for more input from the waiter. 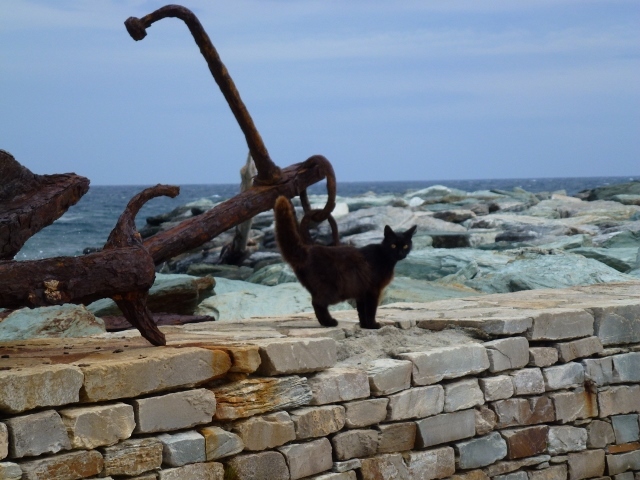 And Mel if you are reading this, find out which Sardinian wines we should stock the boat up with. 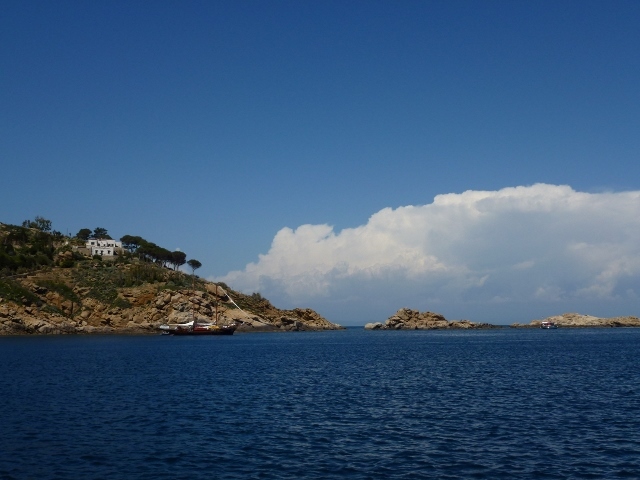 We wake up to a bright sky and wind on the nose all the way to Giglio, a sail of about six hours. 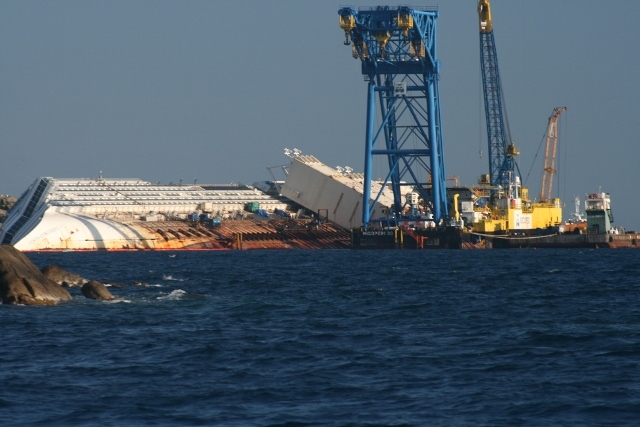 We can see remnants of the Costa Concordia but we will pass her tomorrow and I will try to take photos. 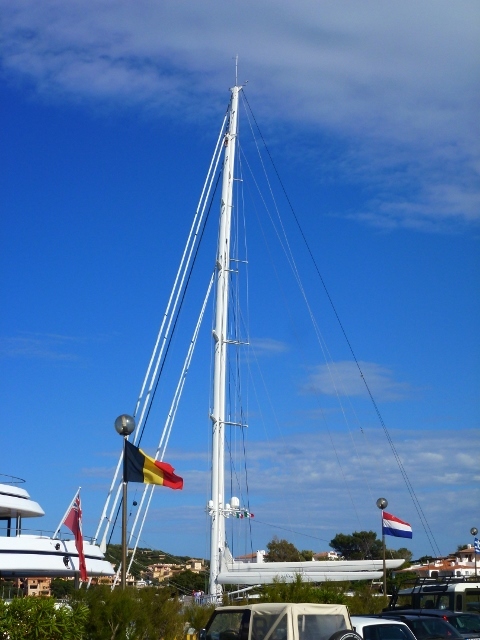 We are anchored in a bay just south of the main harbour of Giglio, called Cala Canelle. We have an anchor watch app on James iphone and 30 metres of chain out. Hopefully, that will mean a good nights rest. (That’s if the piglet in the nearby house stops squealing). Happy Birthday to Geoff, Carol,Kay, Amanda M, Amber and Trina, Happy Mother’s Day to all you wonderful Mother’s out there. Here we are in Roma, still. 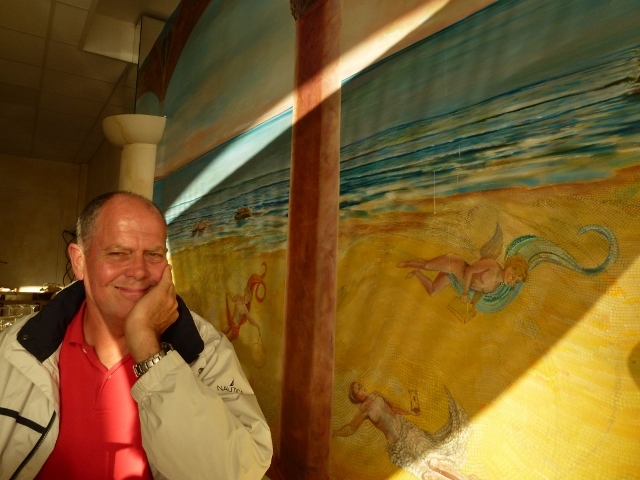 Well, we are really in Ostia; it is a hike to Rome CBD. And if you think Roman time might be slower than what we might experience in New York or Sydney, then Ostia is two steps back from that. We actually enjoy slowing down, (Gaila can say that now that Mercier is in the water), but it would be good if projects discussed for months would actually happen (good for James’ blood pressure). But I digress, we are still in Rome and still enjoying 97% percent of it. It did take over a week to get Mercier in the water. She is in quite good nick, still feels new with no mildew or unwanted animals on board. They took very good care of her and for that I thank Rizzardi; but they didn’t want to give her back. Mercier was surrounded on all sides by sea craft of all shapes and sizes, I don’t think they could get to her. We waited patiently and finally she was in the water, then all it took was a day of washing the Sahara off of her and another day of James single handedly putting the sails on with halyards in place and cleaning out the life raft well and now she is ready to go. So anyone who is envious, think about this all hard work and sit back and relax on your sofa with your glass of wine. It isn’t all glamorous here. 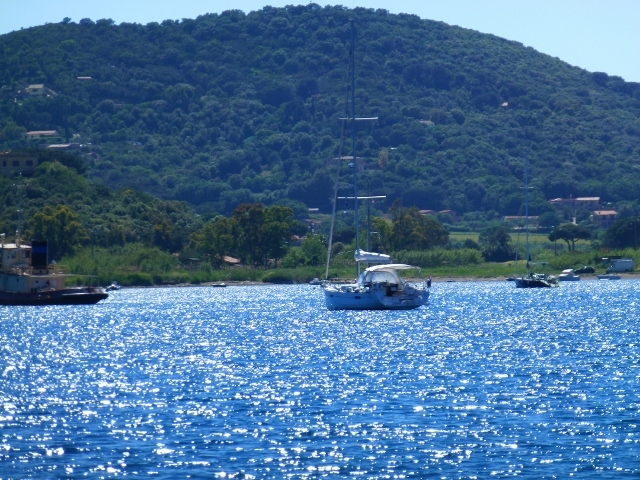 While we were waiting, we have managed several trips to Rome, one to Ostia Antica and another to Bracciano and its lovely lake. 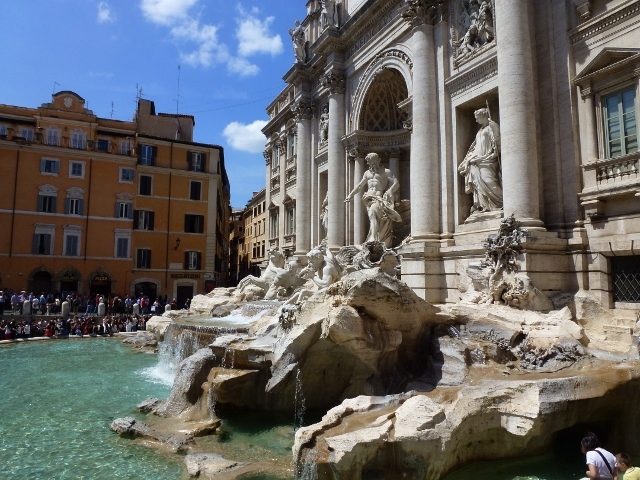 You might have seen my FaceBook posts and think all we do is look for gelato in Rome, but while that is important there are two other missions that take precedent. 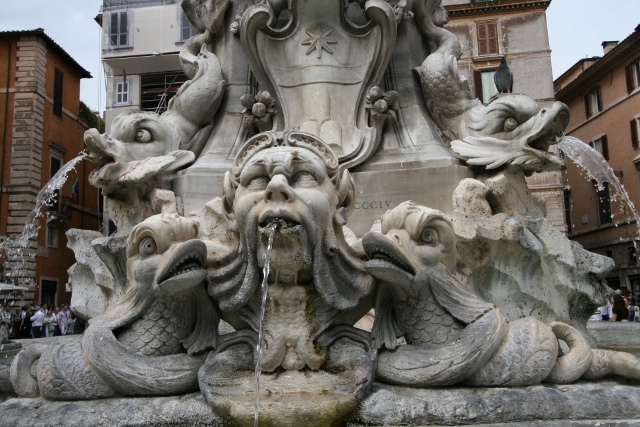 First, we are astonished at all of the history Rome serves up, going back 3000 years without taking a breath. 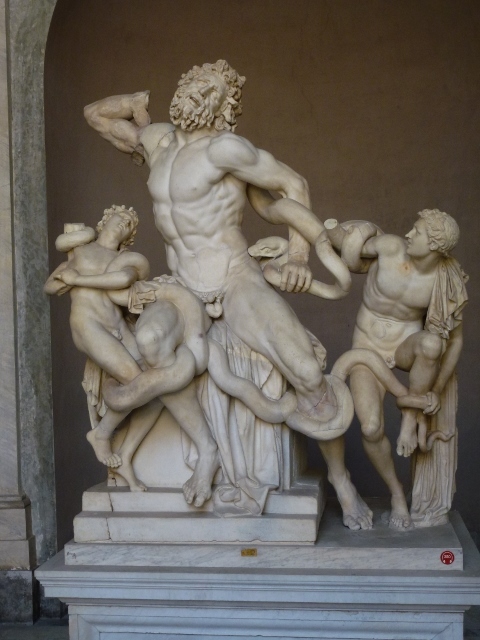 We have visited the Pantheon, The Vatican Museum, St Johns of Laterno, Captoline and Ostia Antica. Our favourites have been the Map Room in the Vatican Museum, where Gaila found her grandparent’s village on a 15th Century map and James was amazed by the Sistine Chapel. We had a wonderful guide, Georgia, who gave us so much insight in the art and sculpture at the Vatican. Amazing is that they have 20,000 visitors per day. 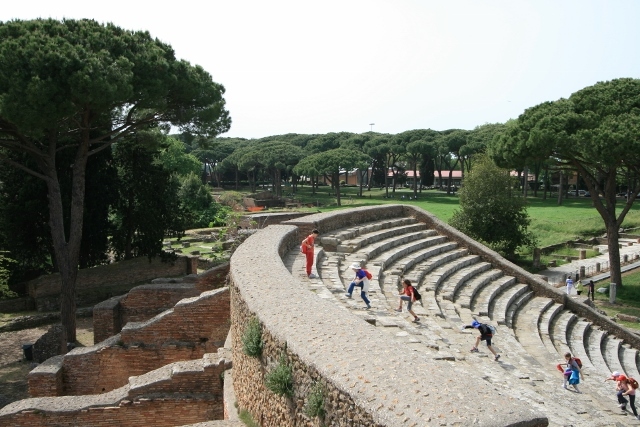 Ostia Antica also gave an insight into how Romans lived, how advanced they were in construction and plumbing even then. There were masses of groups of school children and they were so noisy, the cacophony of Ostia of thousands of years ago seemed to be recreated for us. Even in the years BC, Romans lived in insulae, or multi- storied apartment houses, no wonder the tall apartment buildings in New York seemed so familiar to them. Provisioning and preparations are almost complete, we plan to set sail on Thursday (pending completion of a few more jobs) and look forward to more adventures.